The lush valleys and sloping vineyards of the Marlborough wine region are at their most enchanting beneath the winter sun. 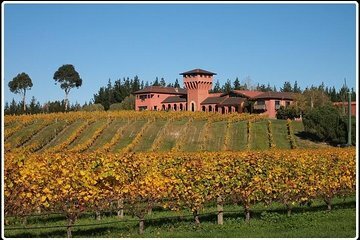 Discover New Zealand’s largest wine region on a private 5.5-hour tour and enjoy a custom-made itinerary including activities like wine and food tasting, a cruise around the Marlborough Sounds, or a visit to the Omaka Air Museum. Your winter wine tour begins with a 10.30am pick-up from your Picton hotel by private vehicle. Having discussed your itinerary in advance, your local guide will have everything arranged for your custom-made tour, so all you have to do is sit back and soak up the scenery as you drive through the vineyards of the Wairau Valley, or past the snow-capped peaks and glittering waters of the Marlborough Sounds. Follow the Marlborough Wine Trail, pausing to enjoy wine tasting (included) at some of Marlborough’s celebrated wineries, and sample popular regional varietals such as Sauvignon Blanc, Riesling, and Pinot noir. Along the way, opt to visit artisan boutiques such as Makana Boutique Chocolate Confections, and sample or purchase regional delicacies such as oils, vinaigrettes, liqueurs, fudges, gelato, and cheeses, or shop for arts and crafts at local galleries and workshops. For lunch (own expense), choose from one of the many cafés or restaurants overlooking the Marlborough Sounds, where you might want to try local specialties like salmon or green lip mussels, or indulge in a delicious Devonshire tea. Other possible activities include a thrilling jet boat ride around the Marlborough Sounds (extra cost); axe throwing, knife throwing and archery (no wine prior to this activity); or a tour of the Omaka Air Museum.